RAM is priced at a premium these days and may not get any better for a few months yet. So when a RAM deal shows up, it's best to jump on it if the modules suit your setup. 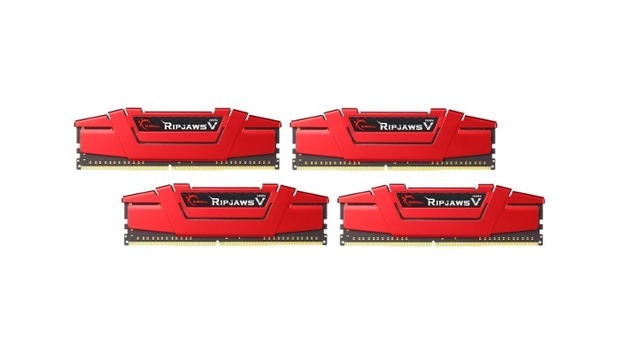 Right now, folks waiting to snag a good chunk of DDR4 RAM are in luck: Newegg is selling four G.Skill Ripjaws V Series 8GB 288-pin DDR4/3000 RAM modules for $174. The RAM comes in red only, and for those into overclocking, this 1.35V kit supports Intel's XMP 2.0. The G.Skill RAM modules are designed with the Intel Z170 "Skylake" chipset in mind, but it's DDR4, so it should work just fine with the newer Z270 chipset for Kaby Lake. It may also work with Ryzen, but you'll have to dig deeper to double check, as RAM support is a little chaotic with AMD's new chips right now. RAM prices for PCs are high thanks to the focus on producing RAM for mobile, as well as servers, with desktops being last on the priority list. That state of affairs isn't expected to get better until later in 2017. Newegg's sale ends on Friday.